From this moment the story, which Ron told in the interview some days before his death, made unexpected turn. But that fact that everything what Ron told goes far away from our daily experience it does not lose its truthfulness. I believe that everything happened that way just as Ron told. If Ron’s story seems fantastic to you, dear reader, just hold it in your memory, and when the time of publication of the proofs comes, recollect the words of Ron Wyatt. Ron said that he “physically felt the presence of the angels”. He saw that there were four young people with him in the cave. They looked as usual young people dressed in normal “daily clothes”. But Ron knew that they were angels. He stood there being rooted to the ground for several minutes unable to speak and even move. He wanted to ask them why they were there, but he was unable to say a word. 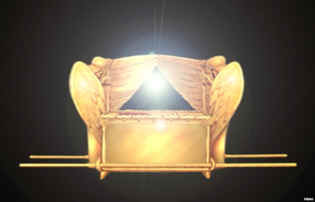 Then one of the angels explained to Ron that they protect the Ark of the Covenant. The angel told Ron to establish support and video camera and switch it on and Ron made a recording how four angels came to the Arc lifted its cover (Mercy Seat) and put it near the Arc. The angel, who spoke with Ron called him up and ordered to remove the stone tablets from the Arc. Ron bent and lifted the tablets. Ron said that the records are made thus, as though the stone was a butter, and God had drawn the words of the Law with his finger on the stone, like on a butter. Then the angels established Mercy Seat back to the Arc and placed the stone tablets to the wall niche. The angels opened to Ron that the Arc and the stone tablets can not be shown to the world before the time when the law obliging all people of the Earth to accept the mark of the beast (see p. 249) issues. After that Ron collected his equipment and left the cave. He immediately rushed to his hotel room, where he watched the video recording with these extraordinary events. To his amazement everything was taped perfectly. He was exited. But suddenly his excitement developed into fear. He understood that now he had the conclusive proof of the discovery, but the angel had told him that these things should not be shown until the law of the mark of the beast is issued. He decided to return to the cave and ask the angel what to do. Ron returned to the cave. The angels were there. Ron said that he had no safe place to keep the tape. Then the angel took the tape from Ron’s hand and put it on the stone tablets. In spite of the fact that the angel told him not much Ron said that he left that place knowing more, than it was said to him. He was convinced that when the video recording, which he had made in the cave, goes on TV screens and, when the stone tablets, on which God had written The Law is demonstrated, the Arc of the Covenant will anyway remain on its place in the cave.